The Schnorr signatures algorithm promises to help to address one of the most pressing problems affecting Bitcoin today: scalability. Additionally, Schnorr signatures could help protect Bitcoin from certain types of spam attacks. An array of new technologies and schemes are being proposed that could help address Bitcoin’s scalability problem, such as Segwit, Lightning Network, and Schnorr signatures. For example, many view the Schnorr signatures algorithm as a simple way of structuring digital signatures that could significantly improve the efficiency of validating a Bitcoin transaction, and it could offer new multi-signature (multisig) modes. 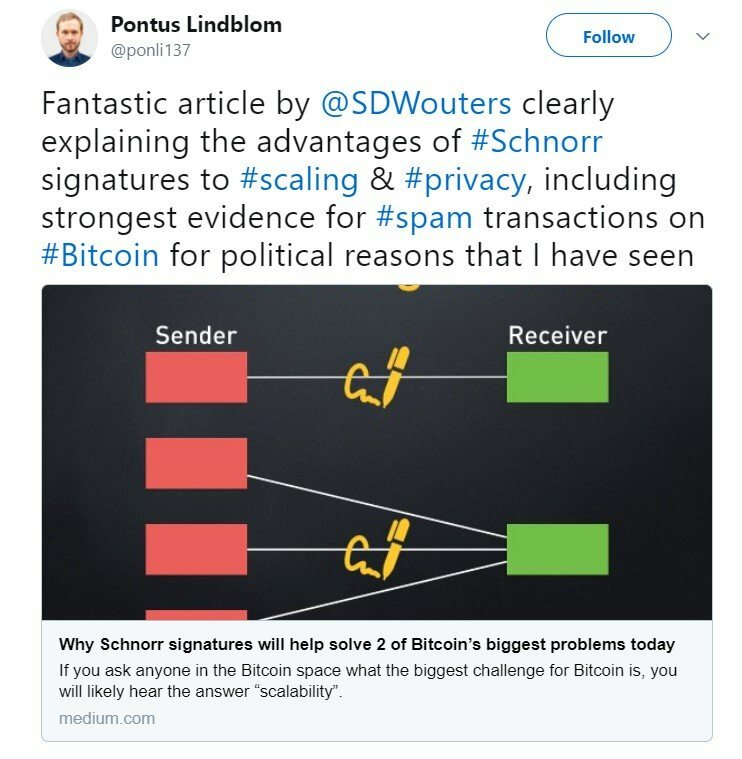 In this regard, Sam Wouters, Bitcoin and Blockchain speaker, wrote an article entitled Why Schnorr Signatures Will Help Solve Two of Bitcoin’s Biggest Problems Today. 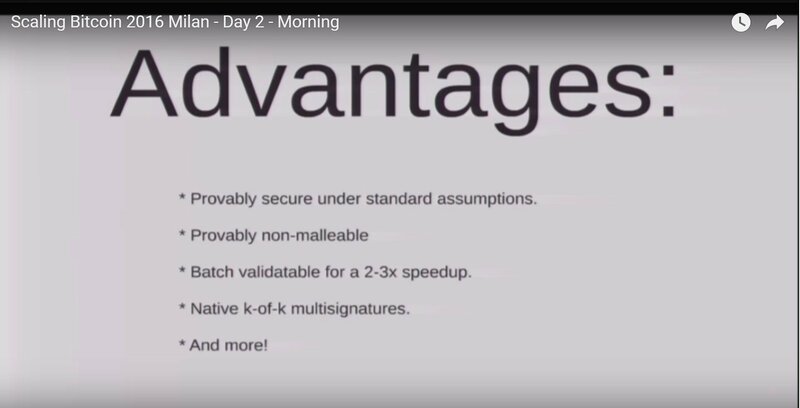 In it, he explains how the Schnorr signatures protocol could help solve Bitcoin’s scalability problem and how it could defend Bitcoin from certain types of spam attacks. Wouters wrote this article in July 2017. Now, however, the article is gaining renewed traction on social media. Valid Bitcoin transactions require signatures. These signatures occupy critical block space. This situation deteriorates when multiple addresses are involved in a transaction because each address needs its own signature. As a result, transaction size requirements increases, which in turn pushes transaction fees higher. At the end of the day, if it is just one person sending that transaction from multiple sources, there should be some way to do so with just one signature, right? This is what Schnorr signatures allow us to do. Fortunately for us, Schnorr signatures would help combat this kind of spam attack. If we only have one signature per transaction, more transactions will fit into blocks and a spammer would need to send far more transactions in competition with more people, and thus likely spend more money to take up the same transaction space. Constant-size signatures irrespective of the number of participants in the multisig setup. The diminished size of data to be validated and transmitted across the network also translates into interesting capacity gains. From a privacy standpoint, Schnorr allows the entire policy of the multisig to be obscured and indistinguishable from a conventional single pubkey. The properties of Schnorr allowing for the combination of multiple signatures over a single input are also applicable to the aggregation of multiple inputs for all transactions. Cryptocurrency enthusiasts agree that Bitcoin must soon solve its problems with scalability and high transaction fees. Therefore, proposals that could address these issues, such as Schnorr signatures, should undergo careful review. Promising proposals should then receive support from all stakeholders to move forward. What do you think would be the impact on Bitcoin if Schnorr signatures replace Bitcoins’ signature digital algorithm, ECDSA? The post Schnorr Signatures Might Be Bitcoin’s Next Step Forward appeared first on Bitcoinist.com. Why e-Chat Messenger Attracts the Attention of Celebrities?